Need an engaging and fun grammar grammar review? Looking to get students excited about applying grammatical and language terms to real life situations? Read on! One goal for all teachers is for students to engage with language. Students can identify parts of speech, verbals, etc., but can they apply that knowledge? 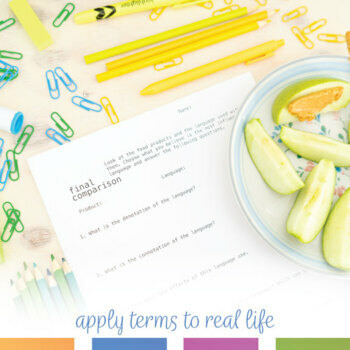 Tell students that with this activity, they will apply their language knowledge - and then eat! 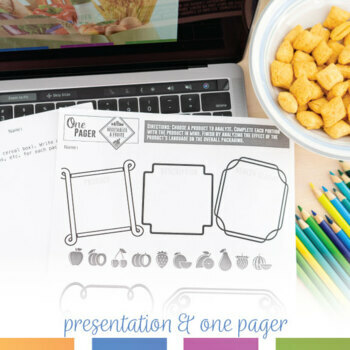 Ask students to bring in a food product and analyze the language with a one pager. I've included a sample for you! In the grammar lesson plans, I have outlined how I find food products (chips, cookies, popcorn, etc.) and have students analyze the language used. As a bonus, I have provided real life examples that I have used with students. After studying language, students will examine the most memorable language and analyze why it is memorable. As an alternative (or in addition), students will cooperatively add to a Powerpoint. It outlines the different food sections and asks students to consider language's impact. This grammar review allows teachers to differentiate easily. You can review any grammar or language concept. I created this so my students realize that the impact of language is in real life. As we finish reviewing, we eat. Students do have fun with this activity. Ready to take the plunge and never buy another grammar activity again? This grammar review bundle is in a larger package. Everything needed to differentiate grammar lesson plans is in the Complete Grammar Curriculum. 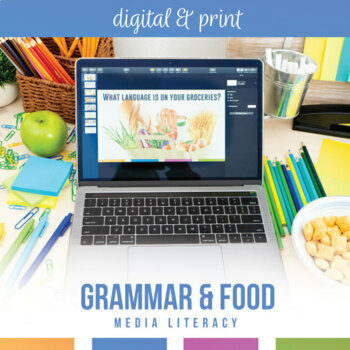 Buy today - and have access to updates for all grammar products, for life!